It feels like autumn is finally here now I have some jars of kaki (persimmon) jam all ready to be eaten. 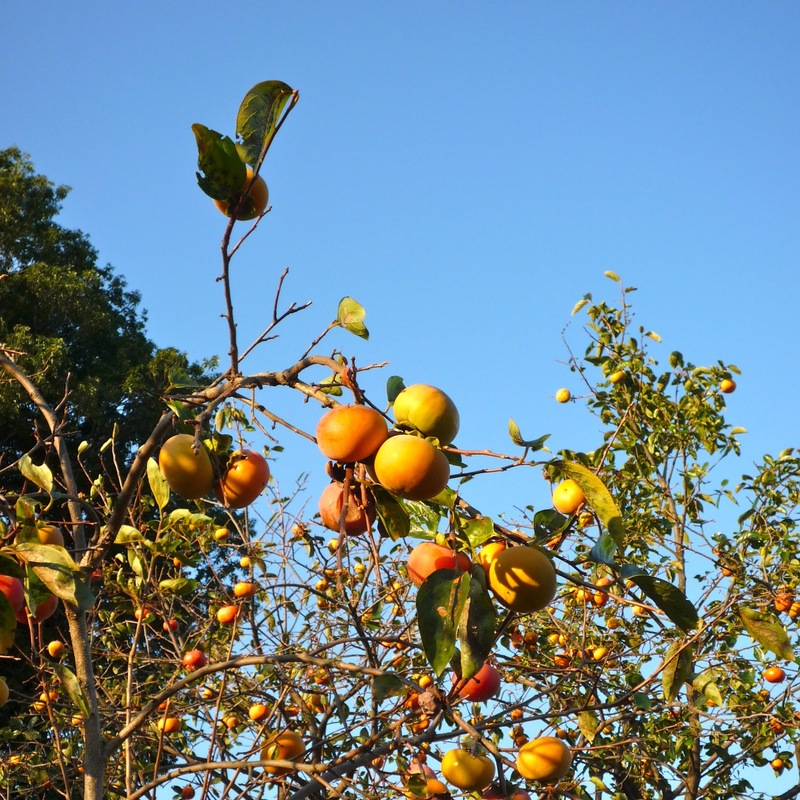 We are usually just finishing the nashi jam when the kaki come in, the nashi jam is light and summery but the kaki jam is thick, sticky and warms the cockles of your heart. Ebi-kun suggested I make more of it this year because it never last long enough! I picked up a bag of windfall Nara kaki in the supermarket, when I opened the bag only one was bruised a little and some of the others the skin didn't look so good but once they were peeled they were fine. These were seedless, which I prefer just because they are easier to cut up, pretty aren't they? The recipe is easy, for each kilo of kaki you need 400g of sugar and 400ml of water, spices to taste, I like a good shake of cinnamon and a shake each of ginger, nutmeg and allspice. Chop up the kaki into bite sized pieces. Put in a pan with the sugar, water and spices, bring to the boil, keep it at a simmer for about 40 minutes until the water has reduced and the jam is thick and sticky. Today I will be surviving on coffee, I was up half the night having a battle with a mosquito, I won, eventually, annoying little blighter. Then I cut the inside of my little finger with the bread knife this morning, I have a feeling it is going to be a looooong day. Ohh I have never tried the bread or the cheesecake, great idea! I've never had persimmon jam before, it looks really good. I like putting persimmons in salad. They're such a versatile fruit. I never thought of putting them in salad! Oh, i love persimmons so much, too! so happy now it´s the season for it. I have a great receipt for a persimmon cake, full of spices, just perfect for xmas, but I´m going to try yr jam receipt, seems delicious and this year i´ve decided it´ll be my present for xmas : buskets full of different kinds of jams and pastries. and it's a lovely blog. i need to organise my chaos, too. Ohhh your cake sounds good! I haven't made a batch of jam yet this year. Giving baskets of homemade jam is a lovely idea!